Housing provision is a major dilemma for local authorities. There is currently a huge demand for more housing, while increasing environmental, economic and political pressures must be considered when local authorities develop their policies. 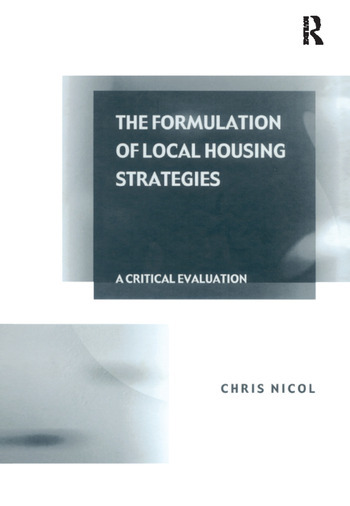 This remarkable volume investigates how local authorities formulate their housing strategies. It questions whether the local authority can be seen as a single entity in terms of housing or whether it is fragmented into separate departments. Incorporating in-depth empirical research from England and Wales, the book discusses whether the process of developing housing policy and allocating land needs to be more integrated, and whether key players such as speculative house-builders should be involved in the development of policy. Analyzing which information sources influence the local authority’s land allocations and housing strategies, the volume debates whether they provide the most useful data and suggests alternative information sources that may assist in better land allocation policies. Contents: Introduction; Housing supply and the housing market; Demand for housing; The development of local authority housing strategies and joint housing studies; Indicators of housing demand; The use of data by local authorities in England and Wales; Housing strategy development at the local level; Concluding comments; Bibliography.